Drive Image is one of those neat utilities from PowerQuest (makers of Partition Magic), the folks from Orem UT who really understand the insides of hard drives. The program is pretty simple to describe -- it will make an image of any partition on your system, and move it to whatever device you want to send the image to. This includes removable devices such as Zip drives, and Syquest's series of removable hard drives like the EZFlyer, along with JAZ drives. List price is $69.95, although the usual sites have it discounted, and PowerQuest periodically has special offers for users of their other products. For example, currently there is a $15 rebate coupon in each package. I stumbled into the program because I was looking for a practical way to backup my partitions, and hadn't really found a software/hardware combination that was relatively inexpensive and foolproof. I got BackMaster, but it didn't work with removable devices, and I did not have any intention of shelling out $400/500 for a DAT drive, the only gold standard if you are using tape. And to be honest, with 4 gig hard disks going for around $150 at the computer shows, I wasn't real hot to spend that kind of money for a tape drive. Well, golly, along comes Drive Image, which sounded like the answer to my concerns. Increasing my desire to find some backup solution was a recent experience blowing out my OS/2 partition with a flakey install of Fixpak 5 and how it handled CD drives jumpered to a slave on the second ide port. Grrr. Not fun. Well, Drive Image 1.0 arrived, and worked, although I had some problems with setting it up to span across multiple removable disks, and the interface wasn't pretty. Then along came version 2.0 of the program, which is why this review is late. Version 2.0 is very polished indeed. The screens look like a windows GUI program although it isn't a Windows program, but it's really a DOS program. In fact, Drive Image is very agnostic about operating systems -- it will work with DOS, Windows 3.x, Windows95, NT, and OS/2, and will handle most of the file systems such as fat, fat32, ntfs, and hpfs. At least in its current version, it only provides 'limited' support for NetWare, Unix, and Linux, which means that if you get in trouble, you're on your own (OS/2 users should be familiar with this type of support, snicker). In order to run the program, you use the CD to create a DOS boot disk, install the removable drive drivers for your zip, syquest or whatever, and the drive image program. PowerQuest is kind enough to provide Zip and Syquest support on the CD, and gives links to web sites of other companies including Cheyenne and Panasonic. The installation takes two floppy disks, and installs a generic version of DOS. Note, this program only runs under DOS, it's required so that it can handle all those locked files your neat operating system of the future has. So, Windows and NT and OS/2 are treated equally! Actually, I like this feature. When you think about it, the time you are going to really need that backup is when you have done something awful to your operating system and it is dead. So you will need to boot from something to do a restore, and it isn't going to be from your dead operating system. This has been one of the problem areas for tape backup devices in general; handling the boot process for a restore. So how does the program work? Flawlessly. You get a GUI set of windows, and even a mouse driver. I did some timing tests just to give you an idea of how quickly the program runs. My machine is a P200 w/128 megs of RAM, a slow (read cheap) Adaptec 1520 SCSI card, and a couple of fairly quick (5400 rpm) IDE drives. Hooked to the SCSI are an internal Zip drive, and an external Syquest EZ Flyer 230 removable drive. I mention all of this because I think that the times would have been significantly quicker with a fast/caching SCSI device like an Adaptec 2940UW. As you can see from the table, Drive Image is very quick when going from hard disk to hard disk. The disparity between those figures and the relatively slow speed writing to the removable drives is, I suspect, the result of my inexpensive SCSI card. Still, these numbers are awesome when you think about the alternative of tape backup speeds. Drive Image offers you choices between speed and compression. As you can gather from having a compression option, the program does not make a real-honest-to-goodness image (track/sector) of your partition, but the image really is what is there, such as partition table info, and the actual used space. Medium and high compression options slow the program down a lot, according to the manual, so I didn't try them. On the other hand, if you want to compress that big partition to fit on one removable disk, you could run the program at night and then who cares how long it takes. There is also a disk to disk option with Drive Image, for cloning the partition to a new drive, or for that matter any free space on any drive. It's pretty cool, for example, if you want to swap your existing drive for a nice larger one, no problem. Just hook up the new drive to your existing system, and use Drive Image to do a disk to disk copy of all the old drives partitions to the new disk. Then swap the master/slave arrangement of the drives, and viola! No problem with the new drive being larger, because Drive Image handle's variable partition sizes on the fly. 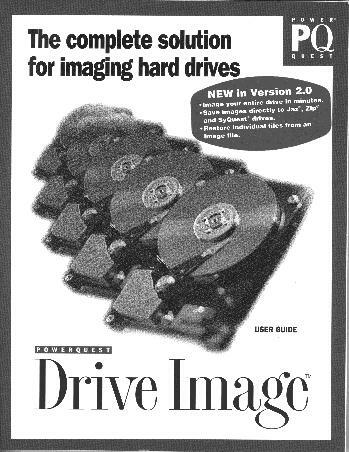 In a recent review, the pro version of Drive Image ($695 list) scored very well against competitors costing up to $3000 (see Improve Your Desktop Image, Information Week, June 1, 1998). The only caveat that I give you is that this is a disaster recovery kind of program -- in order to do a restore, you have to physically wipe out the partition you want to restore. That's right, the restore must be to freespace. Kinda scary, huh? On the other hand, when you think about it, this requirement makes sense. If a partition is blown out to the extent that the operating system is unstable or locked, you really do want to start from scratch and restore your clean, customized operating system just like it was before you did whatever it was you did that took your computer down. And a lot of backup programs, or for that matter reinstalling from your original disks/CD over the old partition, will wind up skipping files that they find on the old partition when installing/restoring. I've been bit by this one before, particularly with an unnamed operating system with the digits 95 in it. As usual, PowerQuest's manual is clear and concise, with screen shots and sample scenarios. I think that they have another winner here, and Drive Image 2.0 joins Partition Magic and the 4DOS/OS2/NT suite from JP Software as my must have utility programs.